joi co-founders Ritesh Tilani and Alper Celen with members of the joi team. 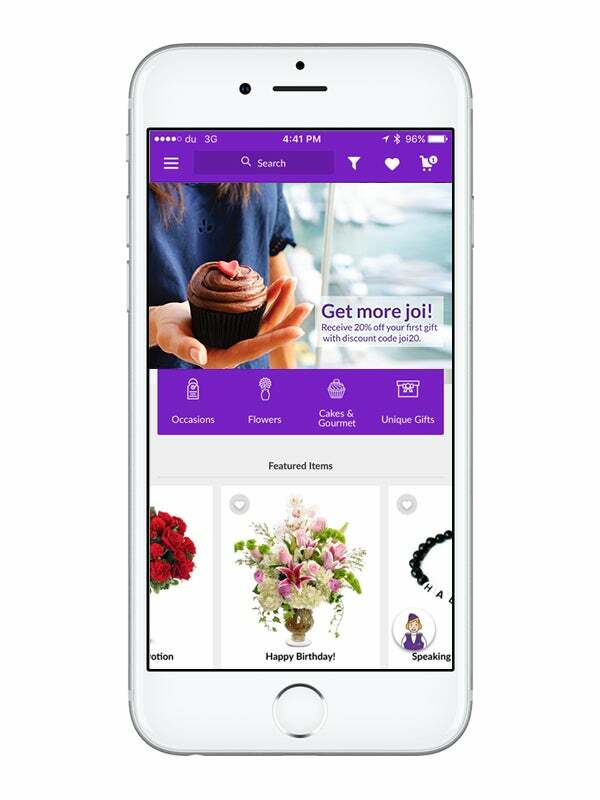 joi offers its users an intuitive interface that lets them focus solely on selecting the right gift, either from their desktops or their mobiles, and in case any help is needed, one of joi’s Angels (i.e. the company’s customer care representatives) are on hand via live chat or phone to assist with selection. The platform offers curated products from flower arrangements, eateries, gift baskets, novelty gifts like personalized jewelry and grooming products, and experience-based packages, even for same-day delivery when possible, with a weekly or monthly subscription for owers available. For enterprises, there’s also joi@work to exhibit appreciation for an employee or client’s loyalty, with even a ‘sorry-as-a-service’ package available to help diffuse an unpleasant situation, such as when a client encounters a negative experience with a company’s service. With operations in UAE and KSA markets, joi works with well-liked brands as merchant partners, such as jones the grocer, Lime Tree Café, Edible Arrangements, Godiva and Magnolia Bakery. On the tech front, they’ve built the joiCam feature on the app to allow senders to record a video or audio message for recipients to play, and reply to it too. Users can also check on their gifts’ delivery status through SMS or push notifications, make use of a calendar feature to mark significant days throughout the year, and also enjoy a notification service for special days with suggested gift ideas. There’s also the automated and intelligent joi Assistant, which recommends gifts based on the recipient’s characteristics and preferences. On top of all of the above features is the startup’s dedication to offering quality customer satisfaction, which, Tilani says, is one of joi’s core USPs. 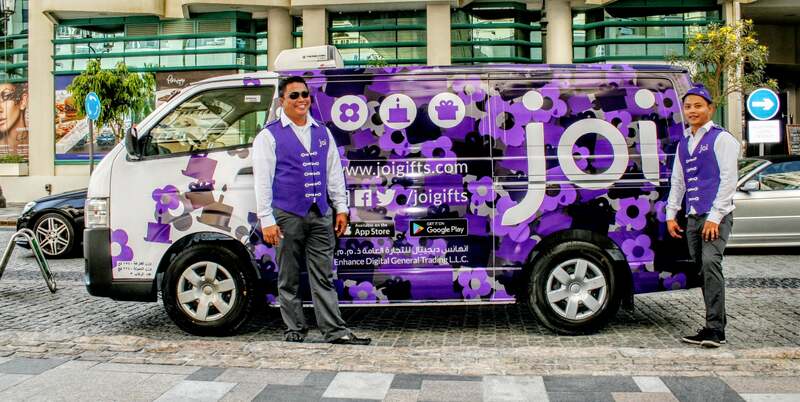 Ensuring their portfolio has a special touch of “joi” in all aspects, their customer care is ensured by joi’s Angels, and gifts are hand-delivered by Agents of joi in concierge-style uniforms for recipients to feel special too. The joiCam feature on the joigifts app allows senders to record a video or audio message for recipients to play, and reply to it too. Fun fact? These Agents of joi don’t just deliver physical gifts, but also experiences, like singing telegrams. Be it with a Happy Birthday medley, Jingle Bells for Christmas (dressed as Santa Claus, of course), or Nat King Cole’s L.O.V.E for anniversaries (which turned out quite popular for Valentine’s Day), Tilani says such efforts leave their gift recipients feeling extra special. However, the joi team have had troubles resulting from these offerings as well- on a Valentine’s Day, for instance, after receiving more orders than expected, they ran into delays in delivery. But joi’s response afterward is what is noteworthy: the team called every inconvenienced customer, with even Tilani and Celen joining in to apologize, explain the circumstances, and offer solutions. “[We] managed to convert some of these unhappy customers into loyal joi patrons with our honesty and sincerity,” Tilani says. Launched in late 2015, the co-founders call joi’s development stage as a “challenging time.” They wanted to launch with complete features from the start, so it took longer as they had to build the backend with the web and mobile web versions first, followed by a mobile app. They utilized a full stack of marketing and analytics tools, and opened in Dubai with just a call center as customer care, and an operations team with two agents and delivery vans. As a startup reliant on logistics, outsourcing delivery was an option; however, since the startup aimed to make the receiving of gifts an experience by itself, assigning such a vital feature to a third party was out of the question. Finding the right talent was also an early hurdle for the startup, in addition to getting brands on board. What got them through? “Perseverance and believing in the vision were the keys there,” Tilani replies. The platform’s customer base addresses the needs of those looking for convenience, quality and value for money, and so far, they’ve made their mark. The team found that their users are loyal: “Once someone uses joi, they keep coming back on a regular basis. So, the challenge is, just getting them to try it once,” says Tilani, and added they’re utilizing online marketing channels to target customers. Today, joi has grown from its launch market in Dubai, to Abu Dhabi and Sharjah in the UAE, and Riyadh, Jeddah and Medina in KSA. Owned by enhance, a UAE-based holding company with backing from Silicon Valley-based 500 Startups, as well as angel investors from the US, Europe and the GCC, joi is currently in the process of finalizing a seed funding round of US$1.5 million. With operations in UAE and KSA markets, the joi team works with well-liked brands as merchant partners. As someone who has been familiar with the MENA ecosystem for a while now, Tilani believes that it is today a better environment with more startups, entrepreneurs, investors and global players. He notes, “Convertible notes are becoming the norm, which speeds up fundraising; the lack of which, was the main reason I had to shut down one of my previous startups.” He still sees a need for more government entities to step up in decreasing red tape and costs of starting new business, including funding and supporting early-stage startups. As for joi itself, Tilani says the plan is for it to explore new markets, and developing more apps with new features is also on the agenda. AI is also an area they’re interested in exploring, as they hope it would increase engagement and loyalty, particularly in being able to intelligently predict a user’s needs and offer recommendations without prompt. In the near future though, joi Luxury, a new sub-brand would be launching for a different clientele, with its customer base and marketing strategy differing from the main portal. At the same time, Tilani says that they’re working on strengthening their tech for more tools to boost their customer service, while also upgrading its delivery and routing process. In the longer term, the platform wants to step up by enabling users to send gifts globally, as well explore including a gift concierge service, bots to provide relevant suggestions, and leverage big data to identify trends to offer better products to its customers. “We think there’s a real opportunity to innovate in this space by using technology, not just at a regional level, but also globally,” Tilani says, noting the opportunity for joi to become a household name in the MENA (and beyond) when it comes to gifting- and from the looks of it, joi could be well on its way to becoming just that. What drives you forward as an entrepreneur? How do you deal with setbacks? "The thing that motivates me the most is the desire to make an impact, to make a difference. I want to make a positive change to the world around me. CareZone was an attempt at exactly that, to empower people to give to their favorite causes without having to give anything extra out of their own pockets, and to encourage brands to give back to the community. With joi, we're making people's special moments a little more special. We called the holding company enhance for the same reason. It helps make a positive difference in the lives of the digital users it touches. I've had my fair share of setbacks in life, but I don't look at them as failures. I look at them as opportunities to learn what not to do next time. And then you just have to get up and get back on that saddle. As long as you don't lose sight of the bigger goal, hitting a few stumbling blocks along the way shouldn't change much." What are your tips to fellow entrepreneurs who are in the process of working with strategic partners for their startup? "I would suggest you think about the potential partner and what they value. Think about how you can fill that gap for them. It could be an opportunity to bundle your service with their offering to differentiate themselves from their competition. This is a very common way for larger partners to drive customer adoption and increase loyalty. Perhaps as a startup, you [could] offer access to a niche audience that is of interest to the potential partner. Whatever you do, don't think about how you're going to be profitable on Day 1. Invest in the relationship." What are your top three tips for an entrepreneur to start a business in MENA? "[First], don't start a business for the sake of starting a new business. Identify a real problem and find a feasible solution for it that somebody would pay for. Building a solution for a problem that doesn't exist, or doesn't apply to most people, is one of the biggest mistakes I've seen first-time entrepreneurs make. [Second], study the market to make sure you know who your competitors are, and what they're offering. If there are offerings that are similar to yours, it'll be difficult to sell your product as a brand new company. Always differentiate, and provide something that your competitors don't. That's how you'll get your customers' attention. [Third], don't hire employees. Recruit believers. These are people who see the vision and will work day and night alongside you to make it happen. And don't sacrifice on talent. Surround yourself with A-players, people who have excelled at what they do. That's the best way to succeed."